(D/R D4) 19 FE 04 (ERD) on 1d Falls (SG.32). 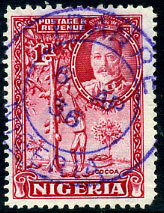 (T.7C) OC 1 10 (ERD) on KE7 1d (SG.34) piece. 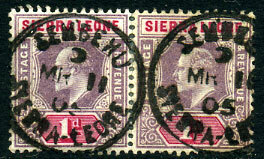 (T.5, 27mm) A/OC 6 04 (ERD) on KE7 ½d (SG.10), minor single perf. tone. 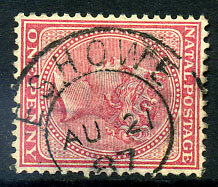 C/AU 23 84 (ERD) on QV 1d drab (SG.39), thinned plus other faults. (T.2A) A/DE 24 00 (ERD) on QV ½pi (SG.40), perf. toning. 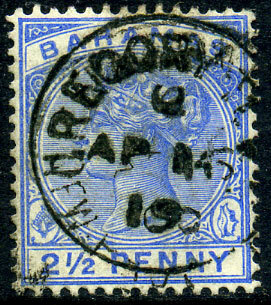 (T.1a) in blue dated JY 30 1902 on KE7 1d (SG.11). 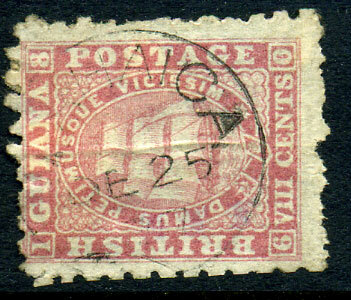 (047.03) */FE 8 26 (ERD) on KGV ½d (SG.131a), very rare office. 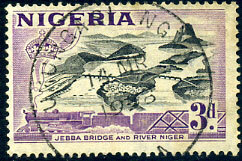 (D1) 14 MR 1958 (ERD) on QE2 3d. 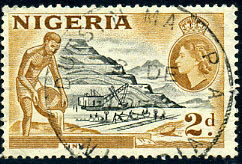 (D1) 8 SP 1955 (ERD) on QE2 2d. 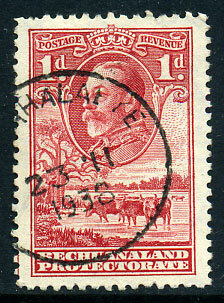 (T.2) red ink A/JA 8 90 on QV 4d (SG.16), harsher toning. 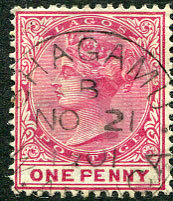 (015.02) rare A/SP 21 21 (ERD) on KGV 1/- (SG.124). 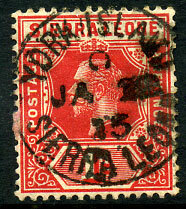 (117.02) C/JA 13 13 on horiz. 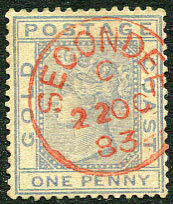 pair KE7 2½d (SG.103). 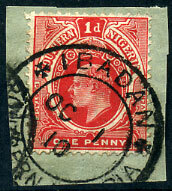 (T.1) dated sideways up C/AP 16 19 (ERD, 19 for 1900) over light fullish upr. 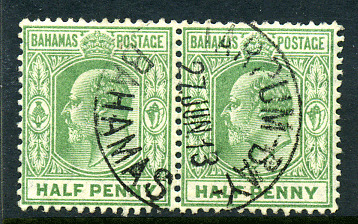 NASSAU cds dated C/AP 14 00. 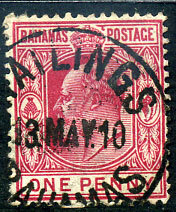 (T.1a) dated DE 25 77 (ERD) being exceptional use of extended village datestamp on re-introduced (or missing OFFICIAL overprint) 1871 8c pink Perf.10 Waterlow ship issue (SG.95), vertical crease. 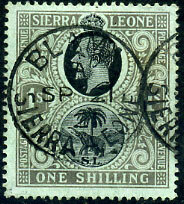 The DLR 8c rose CC wmk (SG.130) delivered to Georgetown 3rd April 1876 and on sale thereafter. 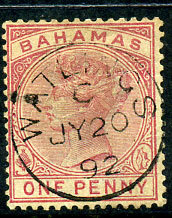 In March 1875 5,000 Waterlow 8c pink P.10 ovp'd "OFFICIAL" (SG.03) despatched by the Crown Agents, London (see T+H Page 166). 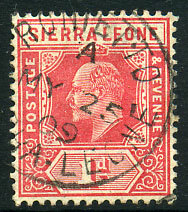 (D2) 13 AUG 18 (ERD) on KGV 1d (SG.82), very rare office. 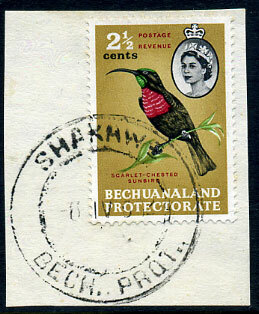 (T.7 I) 24 SEP 10 (ERD) on KE7 1d (SG.72). 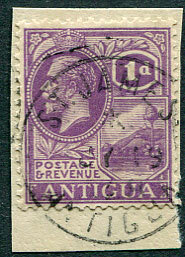 (D2) in purple dated 6 AP 36 (ERD) on KGV 1d (SG.35), corner perf. fault. (120.02) sideways up C/JY 23 25 (ERD) on KGV 1d (SG.132). 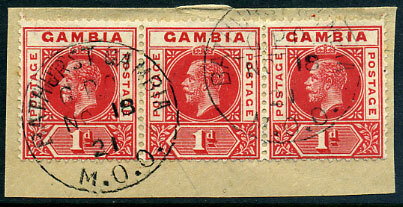 Rarely found on the 1921-27 KGV defins. 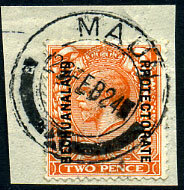 (094.01) AU 30 99 (ERD, "99" inverted) on QV ½d (SG.41), facial scuff at left. 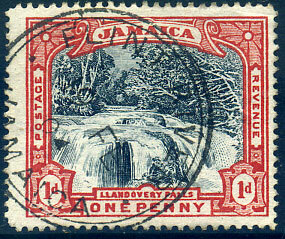 Currently the only recorded example on QV issue. 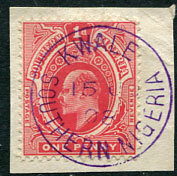 (039.01) */JU 2 26 (ERD) on KGV ½d, 1d (SG.131a,132a) piece. 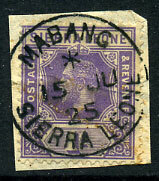 (142.01) reversed C/MR 11 05 on re-joined horiz. 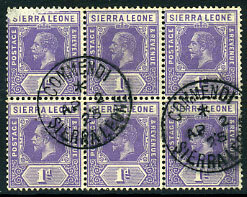 pair KE7 1d (SG.74). Rare on KE7 issues. 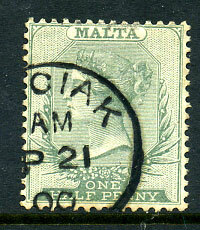 (090.02) */15 JU 25 (ERD) on KGV 1d (SG.132), brownish marks. 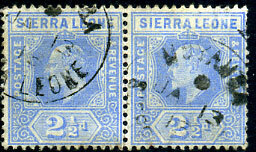 (T.7 I, D3) 27 JUN 13 (ERD) on pair KE7 ½d (SG.71), this datestamp extremely rare on KE7 issues. 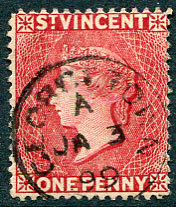 (T.1) C/JY 20 92 (ERD) on QV 1d pale rose (SG.47). 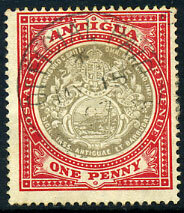 (111.02 revised) dated */14 OC 60 (ERD) on QE2 1/- (SG.217), exceptionally rare office. 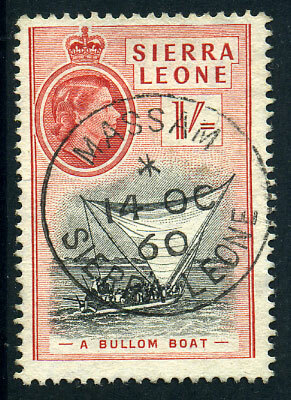 (D8) dated 23 II 1938 (ERD) on KGV 1d (SG.100). 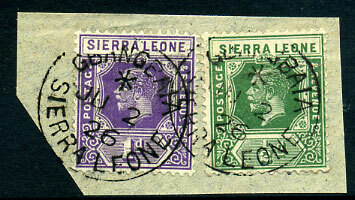 Few examples recorded. 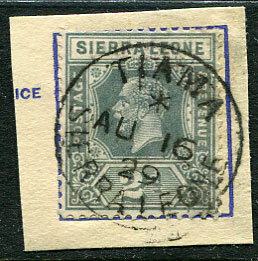 (136.01) A/MY 25 09 on KE7 1d (SG.100a), very rare, few examples recorded. 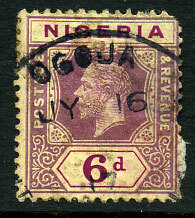 (136.03) */5 OC 55 (ERD), on PSRE piece with added KG6 1d, 9 x overlapping KG6 2d. 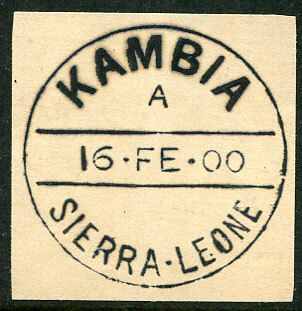 (T.7) 13 MAY 10 (ERD) on KE7 1d (SG.72). (164.03) s/ways down C/JA 28 13 (ERD) on KGV 1d (SG.113). 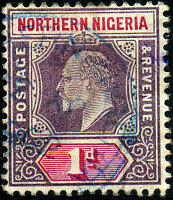 (D3) JY 16 17 (ERD) on Nigeria KGV 6d (SG.7). 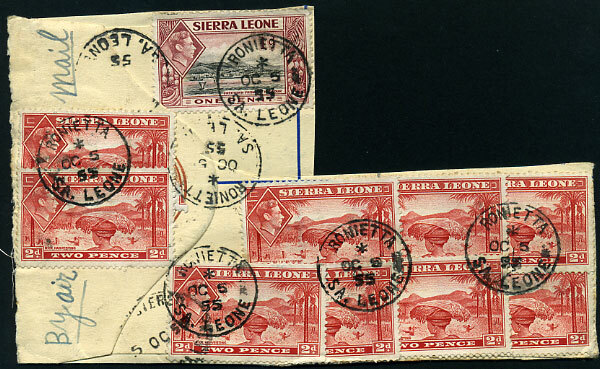 Smaller faults. Recorded by Proud for 30/5/18 to 30/7/18.